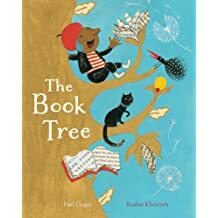 Written by Paul Czajak and illustrated by Rashin Kheiriyeh, The Book Tree reads like a love letter to books in all their sensual glory. Czajak lingers on descriptions of the scent and sound of books as his story of a tyrant’s failed attempt to destroy all books, and a boy’s desire to awe and be awed by stories, unfolds. Kheiriyeh’s textured illustrations complement Czajak’s story and enchant with a bold and deliberate color palatte of red and teal with hints of yellow. Each illustration contains elements at once familiar and unfamiliar: teakettles precariously balanced on heads, oversized dandelion puffs blowing boys away, and regal ladies unsure how to use umbrellas. A story about pleasure, passion, and wayward pages, The Book Tree manages to be both timely and timeless. The book void is felt in schools, theaters, and libraries where, without stories, scripts, and recipes, the town loses its vitality. In a sparse two-page spread Arlo cries over the spot where the mud ate up the last page: “He missed the crack and creak of a book’s spine the first time you open it.” He absently traces the words “the end” in the dirt. The act of writing snowballs and an excited Arlo begins spinning tall tales that he starts to read aloud to passersby. Although he is ignored by his fellow citizens his words nourish the page planted underground and it sprouts. The sprout grows into a tree heavy with books and the townspeople’s love of reading is rekindled. Coincidentally, the mayor is hit in the head by another book, a loud “BONK” reverberating across the page. This time, the mayor reacts differently. Although he initially demands the tree be cut down, he quickly grows to enjoy the tasty meals, cleaver theater performances, and creative stories that books encourage and that the good life demands. The book ends with Arlo and the mayor smiling as they hold a book between them. Writer and illustrator are brilliantly paired in this delightful story that foregrounds the importance of creativity in community building and world-making. Without the Arts there is little to enjoy. Czajak paints a grim picture of a world lacking delicious cuisine to consume, clever plays to delight in, and books to lose or find oneself in. Although it is a world you can get used to, and the townspeople do, at first ignoring Arlo’s stories, it is not a world anyone would choose; and, like Arlo, we do have a choice. You may purchase The Book Tree and other Barefoot Books products from me here. Love your blog, such a brilliant idea. Wow! My son goes to a Montessori School which is where I discovered them and I fell in love. I sell them mostly for the discount and I like to donate some to schools when I can. The themes are important and I always love the art and writing! It’s a really sweet book! I have more reviews of Barefoot Books on my blog. Check out The Boy Who Grew Flowers. It’s gorgeous and sweet and sad.